The 2,300-foot-long Hurricane Deck Bridge is a critical link in transportation at the Lake of the Ozarks, Mo. Built in 1934, the bridge served the community well but is required higher levels of maintenance with each passing year. The Missouri Department of Transportation (MoDOT) evaluated options for improvements to the bridge, which ranged from rehabilitation of the existing structure to a complete replacement. A critical element to MoDOT’s evaluation was how to maintain access to the communities that rely on the bridge for access to business and recreation. To watch a video on the project, click here. MoDOT selected Parsons Transportation Group Inc. (Parsons), and Terracon as part of their team, to provide design services for the rehabilitation options on this bridge in central Missouri. MoDOT chose Parsons for proposing an innovative alternative approach to the replacement option that involved the use of temporary pier widening and shifting the existing superstructure over. This method allowed traffic to be maintained on the existing bridge while the new bridge was constructed, resulting in significant cost savings. Terracon performed the drilling and underwater diving inspection for this project. The structure carries State Route 5 and consists of 463-foot steel deck truss spans supported on caissons in water up to 85 feet deep. 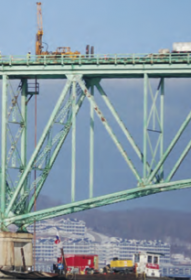 Initially, the biggest challenge with drilling was locating the core holes such that they would penetrate through the bridge deck while missing a 1-foot-square deck grid, the longitudinal and transverse deck supports, and the substructure below the bridge deck, while still encountering the caisson located 105 feet below the bridge deck. Calculations indicated that there was no more than a two-foot-square opening to accomplish this task. In addition to our review of existing plans, surveyors were utilized to make precise measurements to locate the targeted core- hole openings. This was successfully accomplished and drilling commenced. Plans did not indicate any steel was present near the center of the concrete caissons but core drilling indicated otherwise. The caisson cores encountered 3/8-inch vertical plate steel, I-beams, whalers, rebar, bolts, and corrugated sheet steel. The amount of steel encountered in two of the caisson cores, which were about 65 feet in length, ranged from 66 inches to 72 inches. Drilling techniques were successfully developed on-site to handle the encountered steel. Steel was encountered so often, in order to complete seven boreholes through the caisson and extend them 40 feet into bedrock, 14 attempts were made. To further complicate matters, the project site received 24 inches of snow in a single event. The push-boat for the barge platform that the divers were based on had to be used as an ice-breaker to break the 2 inches of ice to allow the divers access to the bridge piers. With 75 feet of casing exposed to the elements below the bridge deck and above the lake level, hot water had to be trucked from a local concrete plant in order to keep the drill rig pumps pumping and the drill-water circulating. Terracon was one of the few companies in the country with professional engineering divers, in particular geotechnical divers, to do the underwater inspection. Terracon divers checked the pier to make sure it didn’t have distressed concrete, cracks, or anything that would affect the integrity of the structure. With one of the largest geotechnical drilling fleets in the country, Terracon was able to bring in drillers from Missouri, Iowa, and Kansas. The Terracon divers came from Ohio and Connecticut. With these resources, Terracon was able to successfully meet the schedule expectations and specific technical needs of the project.